S’more, S’more and more S’mores. All week we have been sharing ideas to make a backyard camping experience one that you and the kids will talk about for the entire summer. And what better way to spend the evening than cooking S’mores over an open fire. 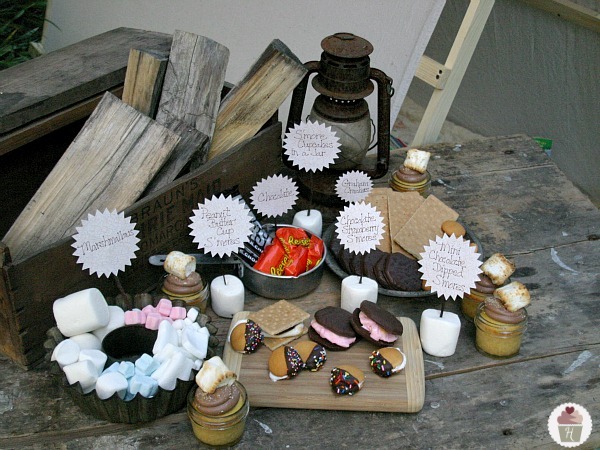 But of course we couldn’t just give you one type of S’more, no we give you a S’more Buffet. 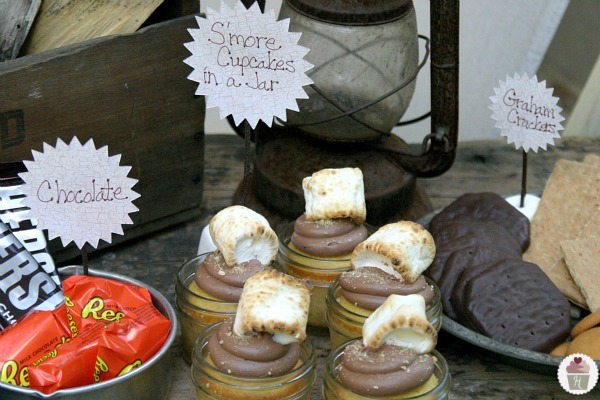 Give your kids and guest options, there are so many ways to enjoy S’mores I’ve seen them all. Some add fruit, I’ve even seen one with cheese. But I’m a tradional type of person so in my mind a S’more must include three things, graham crackers or coookies, marshmallows and of course chocolate. 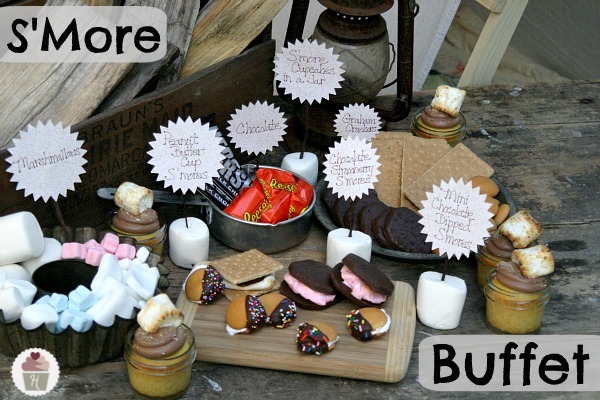 As long as you have these basics you can build all types of S’mores. We’ve added the ingredients for three S’mores, Mini Chocolate Dipped S’mores that combine Nilla wafers and marshmallows into a sandwich then dipped in chocolate. Chocolate Strawberry S’mores, the simple combination of fudge covered graham crackers and strawberry flavored marshmallows. And for the chocolate and peanut butter lovers in the group there’s the Peanut Butter Cup S’mores, a delightful blend of peanut butter cup and graham cracker with the gooey marshmallow. Now of course, you know I just had to add a S’more Cupcake in a Jar. The recipe for these little gems will be in Cupcake Chronicles Newsletter today. Did you notice those cute little signs I made? Super cute…and easy! Watch for the tutorial on those coming soon! And did you see the Backyard Tent in the background? Doug teaches you how to build one of your own…it’s quick, not expensive and really easy! 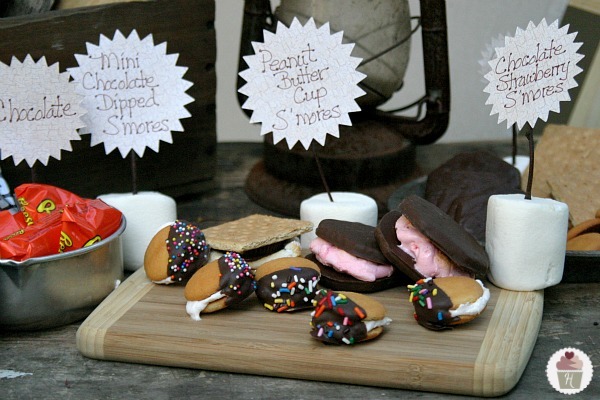 Liz says...my personal favorites are the Chocolate Covered Strawberry, but any way you eat them...you want S'More! What is your favorite way to enjoy a S’More? 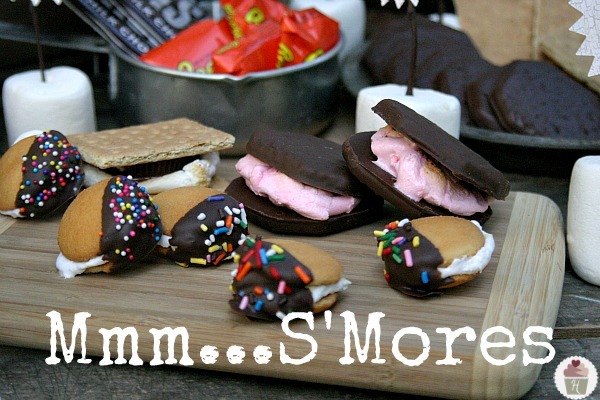 I love all things s’mores! I love all your twists on S’mores! So glad you like the S’More Buffet! The kids love it!